Should the Yankees pursue the 31-year-old Ryu? The Major League Baseball offseason is in full swing, as free agency began for anyone and everyone officially last weekend. The only piece of business left to encumber anyone is the qualifying offer, and those seven players who were tagged have until Nov. 13 to accept or decline. Yankees general manager Brian Cashman said in his end-of-season press conference that the rotation will be a focus point for the Yankees this winter, and after looking at potential opt-outs and internal free agents last week, this week we will take a look at three pros and three cons of five possible free agent options for the Yankees' rotation. In the interest of relevance, we started with the three starters issued a qualifying offer; Monday was Arizona's Patrick Corbin and Tuesday was Houston's Dallas Keuchel, and we finish that trio today with another lefty in Dodgers southpaw Hyun-Jin Ryu. Back in the winter of 2012-13, Ryu came over from the Korean Baseball Organization as the first player switching from the KBO to MLB via posting. The Los Angeles Dodgers signed him for six years and $36 million, and were hoping to get another hit, the same way they had with previous Asian imports like Hiroki Kuroda and Hideo Nomo. What they got was basically three seasons of top-end pitching and three seasons of nothing, at least based on an expectation of 30-32 starts per year. Ryu is now truly on the open market for the first time, and at 31 years old, this may be his only chance to cash in bigger than that initial deal. But, is he a fit for the Yankees? -Soft and steady. Ryu has a pretty consistent ground ball rate (45.8 percent this year, 47.7 career), his .281 BAbip in 2018 was a career low, and he induced soft contact 20.1 percent of the time this year, a career high. In fact, of 168 starters who faced at least 250 batters this season, Ryu's .268 xwOBA (expected weighted on-base average, which is a hit probability based on launch angles and exit velocities of balls put in play) was the tenth-lowest. If you're going to make 20-plus starts in AL East parks, that's huge. -Left Makes Might. Make Ryu seven out of eight in terms of lefties profiled for this series - and in the interest of fairness, the eighth was going to be Chris Sale before the Red Sox quickly picked up his option, so we pivoted to James Shields - so once again: the best way to combat teams stacking lefty hitters against the short porch in Yankee Stadium is, really, to have a strong southpaw starter. Like Patrick Corbin, Keuchel was more susceptible to lefties (.281/.315/.392) than righties (.259/.310/.393) this year, but his career OPS versus lefties is still more than 100 points better than that mark versus righties, and in 2017 it was actually 231 points (as he held lefties to a ridiculous .435 OPS). -Fitting the analytics. When Ryu first came over from Korea, he featured four pitches, but threw four-seam fastballs more than half the time. Now? He's still heater-heavy (more than 60 percent total fastballs in 2018), but he's developed a cutter over the last two seasons, and this year, all but abandoned his slider (less than one percent of his pitches) while working in a sinker (5.4 percent). The Yankees like more off-speed in their repertoire, but Ryu's profile this year was basically Luis Severino, only with a curveball instead of a slider, and a change that is truly an out pitch. -Dis-Qualified. 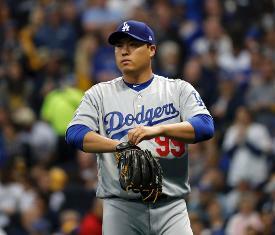 Ryu received the qualifying offer from the Dodgers, and has until Nov. 13 to make a decision. If he declines, he's a free agent, but if the Yankees were to sign him, they would have to forfeit their second-highest draft pick and $500,000 in international bonus pool money. The Yankees will be picking somewhere in the late-20s in the non-first draft rounds, but as a team that usually hoards bonus money instead of eschewing it, that $500K could loom large. It likely won't, as teams can (and the Yankees usually do) add up to 75 percent of their bonus pool in other deals, but it has to be noted. -His name anagrams to Injury. It actually does! But the pun aside, Ryu has a pretty shaky medical history for a 31-year-old: in 2014, he missed time with both left shoulder inflammation and a right hip strain; in 2015, a left shoulder impingement led to labrum surgery that cost him the entire season; in 2016, recovery and setbacks from that, as well as left elbow tendinitis, limited him to one MLB start and 28 rehab innings; in 2017, a couple of fluke injuries (a left foot contusion and left hip contusion) cost him a total of 30 days; and, last year, he missed more than half the season after completely tearing his left groin. For those who kept count, that's eight DL stints and injuries to seven different body parts in five years, a good chunk of them to a left arm and shoulder that had 1269 innings and a Tommy John surgery already on them when he came over from Korea. -Six up, one down. Ryu has been a solid top-of-the-rotation starter when healthy, pitching to a 3.20 ERA, 1.2 WHIP and 8.1 K/9 in his 97 career outings. In October, though, he is Dr. Jekyll and Mr. Hyde and then some. Out of seven starts, three have been great - seven shutout innings in the 2013 NLCS, six innings of one-run ball in the 2014 NLDS, and seven shutout innings in the 2018 NLDS - but in the other four, he has allowed 15 earned runs in 15 innings. And, he allowed 11 of those runs in 12 innings in three starts between this year's NLCS and World Series, which is a disturbing trend.